A gloriously glittering fish will emerge from the deep blue sea background with this mosaic-by-number project. Improve fine motor skills and develop attention span by filling in the wooden board with over 600 stickers. 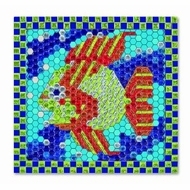 After completing the fish, your child can place the sticker tiles on the frame to add the finishing touch. Measures 11.75" x 10.75" x 0.75"